Finding this restaurant was a relief because the day before Scott and I had wandered around alleys and major roads looking for a restaurant that served oat noodles. We never found that restaurant and the hunt left us grumpy, hungry and disappointed that we were unable to try oat noodles…how great do those sound!? So when we set off with the address of this restaurant in hand and the promise of top g rade beef from a nearby Chinese province, I secretly crossed my fingers that we’d find the restaurant without too much wandering. 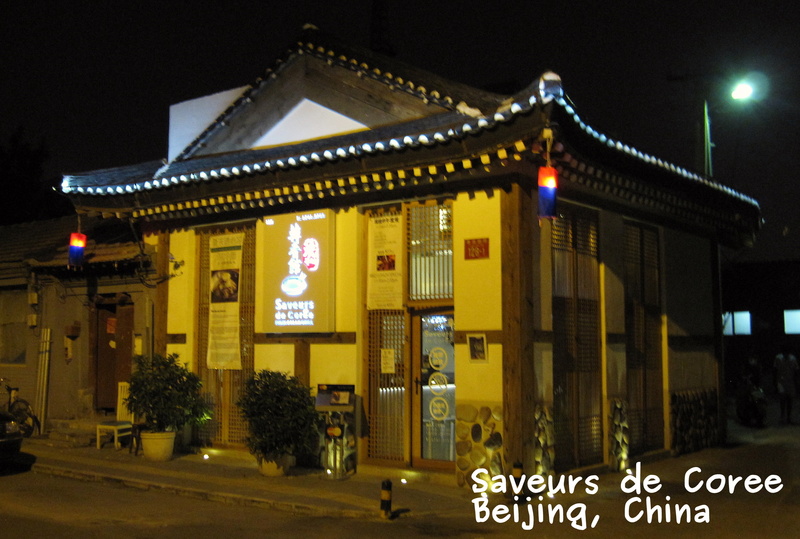 What we found was a lovely little restaurant in a Beijing hutong. (Hutongs are small alley/ neighborhoods…it’s hard to describe exactly.) As soon as we stepped inside we were impressed by the architecture and the décor, which was minimalistic and airy. As our evening progressed we were more and more delighted: there was a fruity soju cocktail, melt in your mouth beef, fresh kimchi, cute dishware, crispy-n-crunchy sesame coated tuna, cinnamon tea with pine nuts…oh my! We had a lovely dinner…read on to find out the breakdown of this far away, but doing things somewhat locally, restaurant. Their website advertised beef from Liaoning province and seafood from Shandong province. I was very excited to find a restaurant that sourced its ingredients, this wasn’t something I often came across when I dined out in China. The menu was well designed to explain their food items and to explain their mission to serve healthy, sustainable and MSG-free food. This place definitely gets a 5 because we were able to enjoy the Korean flavors we love and are familiar with punched up a notch as well as experiencing some new tastes. I really like Beef Bulgogi. I’ve even made it a few times and it’s always beefy and sweet, but the Beef Bulgolgi at Saveur de Coree stands out as the best I’ve ever had. We grilled it on our tabletop grill. The meat was wonderfully marinated and tender. We experienced something new when we ordered the iced cinnamon tea; it was cooling and spicy at the same time. It came with pine nuts floating on the surface. (And anything with pine nuts gets my thumbs up.) We were hoping to try a dessert of sweet rice balls dipped in nuts, but they didn’t have any…that would have been another new flavor experience and a tasty treat! We were seated near the kitchen (in a tiny restaurant like this with a kitchen on each floor, most diners will be seated near the kitchen). I was hesitant because I thought it might be noisy, but I barely even noticed; and when I did notice, I was charmed. When our food was up, the cook notified the server by lightly donging a gong. 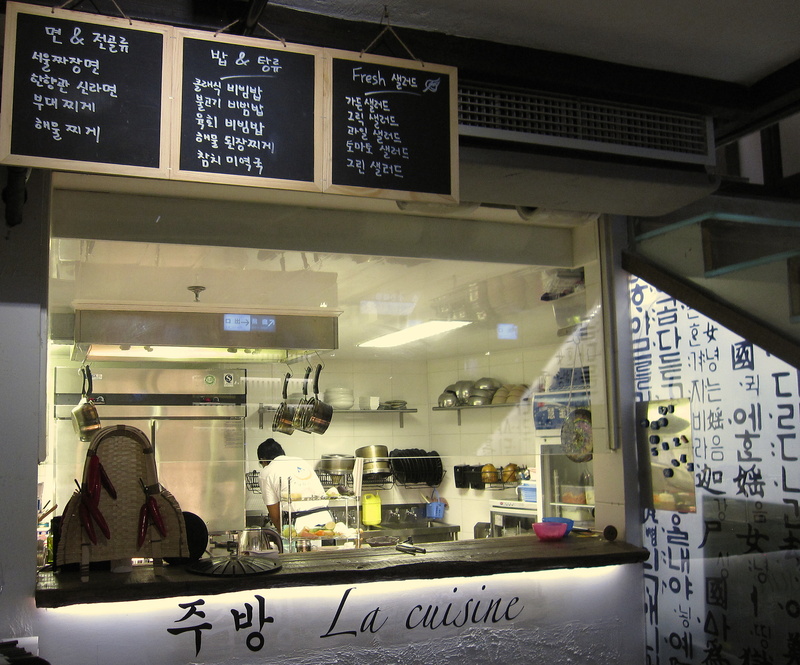 It’s a simp le thing, but significant because most of the time when you sit near the kitchen you hear something like “order up” in the States and probably its equivalent loudly spoken in Chinese. 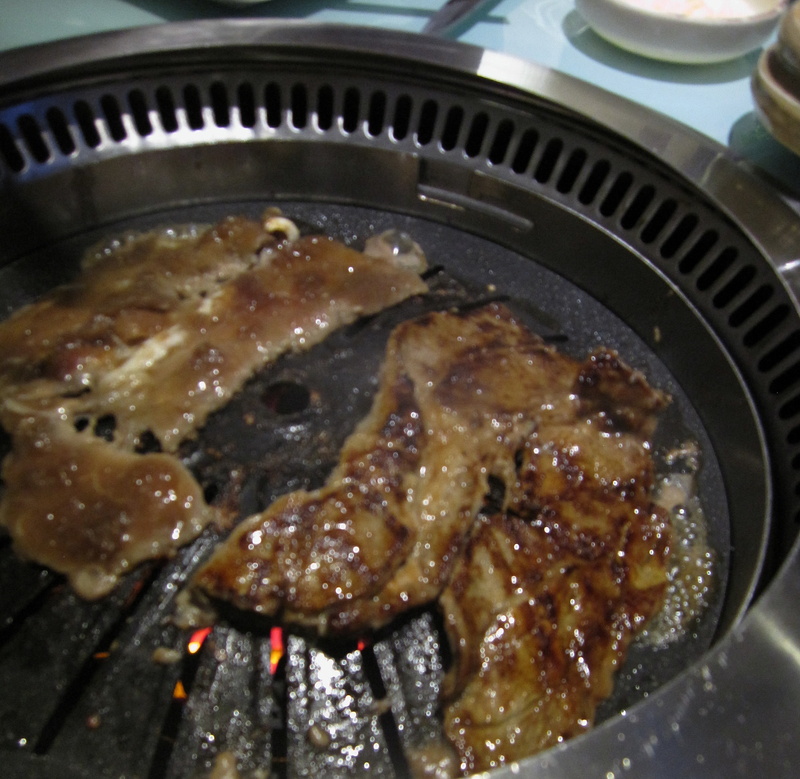 Korean barbecues are fun, but they can sometimes be uncomfortable. The grill is right at your table so you can really feel the heat. This place tried hard to create an elegant yet comfortable table with a grill top. As I sat down, I was told that I could put my purse into my stool—the seat lifted off and the stool was a small storage unit. This was something new for me and it was nice to have my stuff out of the way. The design of the place was interesting. There were 2 floors, but the second floor was more of a loft. There were rustic wooden beams and white stucco walls. It was a charming atmosphere in which to eat.